The entanglement of knowledge, space and power in Area Studies is the topic of this chapter, which aims to provide an outline for a reconceptualization of the Americas as a space of entanglement as well as elements for the decolonization of knowledge. 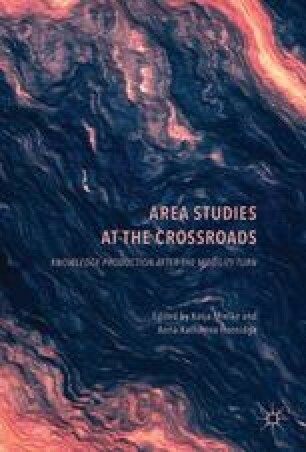 The chapter begins with a short discussion on the emergence and dynamics of Area Studies in and on the Americas. Thereby the construction of the “area” of the Americas is analyzed in terms of coloniality. In the main part, this contribution discusses two aspects that are highly relevant to Area Studies: space and knowledge. First, it proposes a framework to rethink hemispheric Area Studies in terms of the—still fuzzy—concept of the Americas as a space of entanglement. Second, it criticizes the hegemonic geopolitics of knowledge and proposes dialogical, entangled methodologies. The chapter ends with a plea for a relational and pluri-topic Area Studies that reflect power relations and that do not fix or define the meaning of areas. Yellow Horse Brave Heart, M. (2005). From Intergenerational Trauma to Intergenerational Healing [pdf]. Wellbriety, 6(6). Available at: http://www.whitebison.org/magazine/2005/volume6/wellbriety!vol6no6.pdf [Accessed 15 Apr. 2012].